NOTE: Federal contractors and/or subcontractors are required by law to post certain compliance posters. 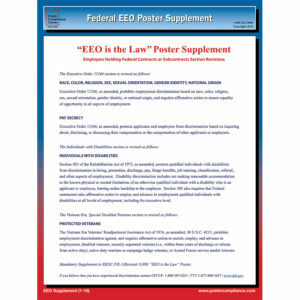 The Federal EEO Poster Supplement must be posted with the Federal “EEO is the Law” Poster (revised 11-09) at the site of the work in a prominent and accessible place where posters may be easily seen by employees. Includes mandatory posting requirement for federal contractors and sub-contractors to be posted with the Federal “EEO is the Law” poster in a format that is accessible and understandable to individuals with disabilities and disabled veterans. Poster Compliance Center’s Federal EEO Poster – Large Print offered in 18 point text meets these posting requirements (under Section 503 of the Rehabilitation Act and VEVVRA – Vietnam Era Veterans’ Readjustment Assistance Act). 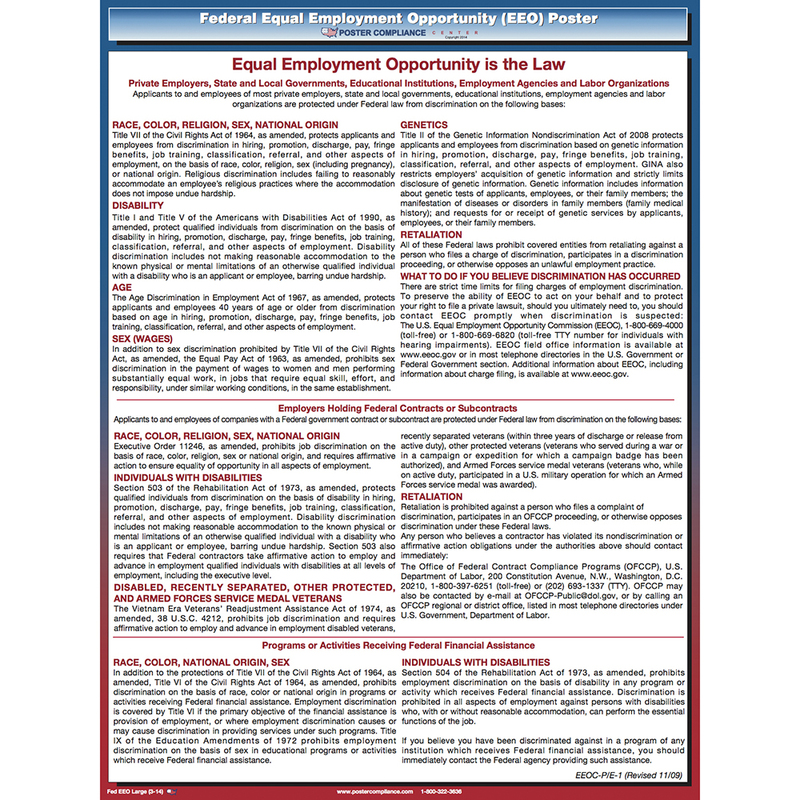 For information about other available alternate formats for the EEOC poster, such as Braille or audio, for those with disabilities, please go to the U.S. Equal Employment Opportunity Commission Publications page (see “Alternate Formats”).